Drawbar pulling leadership: the hydrostatic transmission on the common rail FPT Industrial engine delivers best-in-class pulling capacity and controllability. All the working parameters can be customized by the driver for excellent machine controllability and faster cycle times. Productivity boosting electronics: the cab controls offer a wide choice of electornic settings and automated functions that make the driver's job easier. Together with the lowest noise level in the market, they minimise fatigue and long working days. Quick maintenance: the tilting cab provides an oustanding accessibility to all main components and enable you to service the L-Series from the ground for any extraordinary maintenance. The FPT Industrial Tier 3 Engine delivers top performance in load response, maximum torque, power and fuel economy. The turbocharged engine with an Air-to-Air intercooler relies on well proven multi injection technology to maximise torque back-up and fuel efficiency with reduced engine noise and vibrations. The entirely re-engineered transmission offers best-in-class pulling capacity combined with the typical maneouvrability of the hydrostatic solution. The cooling package of the 2050M has been redesigned and fitted with a hydrostatic reversible fan. In the new design the radiators are mounted with no overlap, so that each radiator receives fresh air, mantaining constant fluid temperatures. The hydrostatic fan continuously adapts its speed to match the real cooling demand, reducing power absorption. The reversing mode reduces maintenance needs and lengthens cleaning intervals. The CASE Lubricated Track (CLT), standard on 2050M, is sealed and lubricated with an oil reservoir in each pin. For lond wear life, pins and bushings are sealed to keep the contamination out while maintaining lubrication. 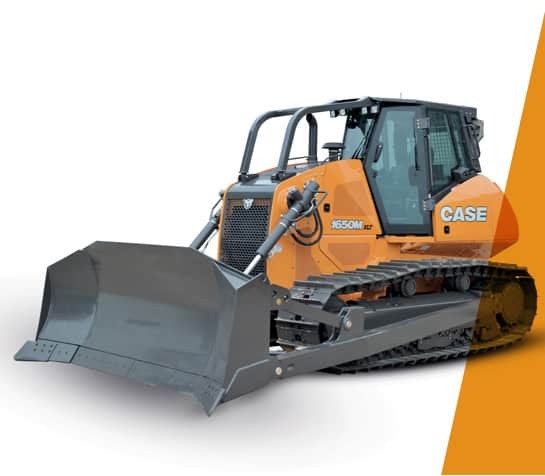 In abrasive soil conditions, the optional CASE Extended Life Track (CELT) provides outstanding durability. The 2050M cab is engineered for operator performance, comfort and safety. The new positioning, further forward on the machine, ensures complete blade visibility. The operator can work with confidence and more productively in every operation.